We have been watching old musicals around here, mostly checking out from the library. 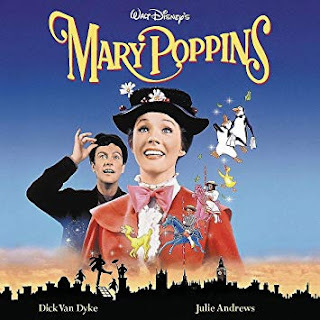 It started with Mary Poppins, which we watched because one of the girls' friends dressed up as her for Halloween (and coincidentally so did our cousin's family, which we saw on Facebook later!). The girls both liked it, and Jane especially liked that the little girl was named Jane! The songs were a big hit, and we've listened to the sound track multiple times (it's available free with Amazon Prime music). It was just a REALLY long movie, at more than 2.5 hours. Many scenes could have been edited tighter and some eliminated. But times have changed, as have attention spans I guess?! Jane had no trouble watching it all the way through, but Livia was bored in some parts. Not sure if we'll try to see Mary Poppins Returns in theaters, but I do look forward to watching it at some point. From there we watched Bedknobs and Broomsticks and then Chitty Chitty Bang Bang, which is one I probably had seen at Great Aunt Norma Lee's house because we would rent and watch movies often when we would stay there. CCBB wasn't a favorite, but it does have a couple of great songs. It too was a LONG movie, nearly 3 hours, and could have used editing even more than Mary Poppins. The first copy we got was scratched, so we had to track down another copy at a different library branch. And just yesterday I noticed it's available on Amazon Prime, so Jane wants to watch it again. Since we're on Thanksgiving break we plan to do that this afternoon (starting before Livia gets up from her nap so she doesn't have to watch ALL of it again, even though I'm sure she'd say she does want to see it all). I've started thinking about other movies that were old when I watched them as a kid that Jane hasn't seen. She's kind of sensitive and gets scared easily (let's not talk about The Grinch - Jim Carrey version - shall we? ), but the older movies, especially musicals, seem to have enough whimsy and make it clear what's pretend scary (or even what they try to show as scary is just silly when it's being sung!). There's The Wizard of Oz, and also Heidi, the Shirley Temple version. I looked that up on Amazon and there was a DVD available for about $4, so Jane's getting that in her stocking! I know we watched a few other Shirley Temple movies on repeat, but I can't remember now. I'm sure I could find them just by looking at her Wikipedia page. Sound of Music is another one (and also LONG!) that Jane might enjoy. There are also a lot of Disney movies Jane hasn't seen (Beauty & the Beast, Lion King, etc. ), and we can probably find those via the library. Do you have any movie recommendations that would be suitable for a 7-year-old with a sensitive side -- either from when you were a kid or current favorites?